Newborn babies view the world through a fuzzy haze. In fact, your baby can only see objects clearly if they're about eight to 10 inches away. At some point during the first month or two, your son or daughter will begin to follow a moving object or toy with his or her eyes. Hand-eye coordination also starts to develop during this time period. As your child learns how to coordinate eye movements, you may notice that his or her eyes may appear crossed at times. Occasional misalignments are perfectly normal at this stage, although crossed eyes should be evaluated if they continue longer than a few months. The world becomes much more colorful during this phase of development. Colors no longer blur together but are now easier to distinguish. 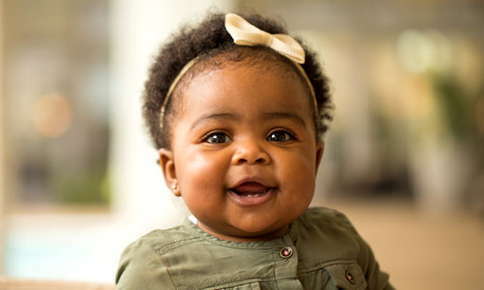 By two to three months, most babies can recognize parents, siblings and other important people in their lives. Depth perception improves around the fifth or sixth month of your child's life. The visual pathways in the brain are now developed enough to recognize three-dimensional images. As your child learns to control and coordinate body movements, he or she will be able to successfully reach and hold toys or other objects. Scooting and crawling expands your little one's world and offers more opportunities to use and refine vision. Object permanence, the ability to understand that an object still exists even though your child can't see it, develops around five months. Crawling and walking not only help your child become more mobile, but also play a role in strengthening hand-eye coordination. By the time your baby is 1 year old, his or her vision should be well developed. He or she should be able to easily see both near and far objects, throw balls with ease and enjoy pointing out favorite images in books. Hand-eye coordination and depth perception will continue to improve during your child's first and second years. Premature babies are at risk for retinopathy of prematurity, a condition that most often affects babies who weigh 2 3/4 pounds or less or are born before 31 weeks' gestation, according to the National Eye Institute. The condition occurs when abnormal blood vessels form in the retina and interfere with vision. Crucial pathways between the eyes and brain may also be underdeveloped in premature babies, which can affect their ability to see even if there is nothing physically wrong with their eyes. Other eye conditions common in premature babies include strabismus (crossed eyes), nystagmus (involuntary eye movements) and reduced visual acuity or refractive errors. Are you concerned that your baby or toddler may have a vision problem? Early diagnosis and treatment of vision issues will help reduce the risk of permanent problems. In addition to eyeglasses, if needed, your child may benefit from vision therapy. The therapy enhances the brain-eye connection, improves muscle control and trains the eyes to work together as a team. It's never too early to start therapy. In fact, early childhood is the optimum time to begin vision therapy, as pathways in the brain needed for good vision are very adaptable at this point. Contact us to schedule a comprehensive vision examination for your baby or toddler.